Answer: There’s no definitive answer to your question. Several explanations have been proposed. Much of what I know comes from the book The Discoverers by Daniel J. Boorstin. Most of what you find online about “days of the week” has to do with how the days got their names, and that doesn’t answer your question. Historically, different cultures around the world have used cycles of anywhere from 5-10 days per week. Each used their own choice of day names. The details of the systems varied, but in all cases the need for some type of system was driven by the natural human desire to subdivide measurable quantities for convenience and precision. For a brief period in France, after the Revolution, they tried a 10-day week mirroring their new metric system. Consider any unit of measurement you’re familiar with. Having fractions of that unit, each with its own name and symbol, makes the process of measurement easier (kg, g, mg, μg). The same idea applies to measurements of time (year, month, week, day). The year, month, and day are all based on astronomical cycles, but the week is an arbitrary unit. Modern society has settled on seven days per week, and that choice appears to goes back to ancient Rome. 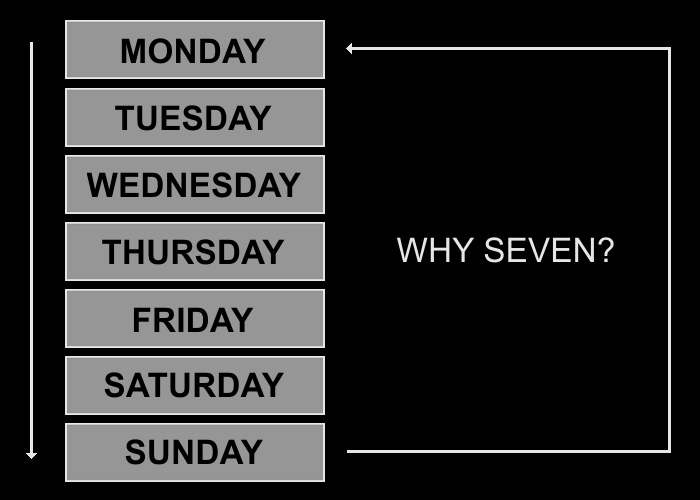 But why seven? The number 7 has always had special significance in many cultures — the seven hills of Rome (Roman), the seven wonders of the world (Greek), the seven deadly sins (Christianity), the seven days of creation (Biblical), the seven visible “planets” (Mercury, Venus, Mars, Jupiter, Saturn, Sun, Moon), the seven gods of happiness (Japan), and others. The month had long been established based on cycles of the Moon. One lunation (the time between one Full Moon and the next) lasts 29.530588 days. If you want to subdivide that time into smaller units, a 7-day week gets you pretty close to a quarter of a month. Of course, so does an 8-day week (which the Romans used until the early third century AD). So I don’t really have a definite answer to your question CM, sorry. It’s just one of those things that goes too far back in history to know for sure. Unlike the year, month, and day, the 7-day week was an arbitrary choice adopted by many ancient cultures — some as early as the 6th century BC.